A fabulous mish mash of literary YA with paranormal. In some ways, The Rest of Us Just Live Here isn't about much. It's basically just about a bunch of normal kids going about their lives. 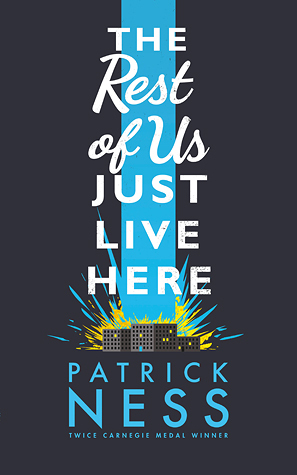 There's some really strange paranormal stuff happening on the periphery, but the crux of the book is about the regular goings on of Mikey, his sister, and his two best friends Henna and Jared. If you like books about issues, but don't like "issue books," this is the book for you. So many issues - OCD, eating disorders, alcoholism, troubled families, LGBTQ, etc. It delves into these issues very thoughtfully, with lots of lines that you want to highlight so you'll remember them. You could argue that there are too many issues in this book to feel realistic. Everyone has problems, but not everyone has direct links to every possible problem. That may be true, but it didn't feel that way while I was reading it. I loved the paranormal element. It was written a little tongue-in-cheek, like a parody of every paranormal ever. Not to the extent of Fangirl, but in that line. There are these "immortals" who are slowly trying to take over the town and by extension the world. But it's up to the "Indie kids," or the "Chosen Ones," to deal with them. Our characters only interact with the paranormal element on the sidelines. The goings on of the "Indie Kids" is written in brief bolded type at the top of the chapters. I got a kick out of it. Mikey is a character remarkable only for his unremarkableness. He suffers from OCD, which is rarely discussed in literature unless it's the punchline of a joke. It's dealt with really well here. I understood why it can be so disruptive to his life. Yet Mikey is a fully formed character. He's kind and funny to his friends and protective of his sister. He becomes nasty in his jealousy towards a new kid who appears to getting close to Henna, who he's in love with. Mikey is a person I would like to know, despite his flaws. The book can be a bit slow, but I didn't think it dragged too much. I was able to get through it quickly, because I enjoyed being in that world. It's not the book to read if you want a thriller, but if you're looking for a thoughtful read with a bit of paranormal satire, you will love this one. Yes! This was such a good read! I was so excited to get the galley at ALA last summer for this one, but it's languished on my bookcase and I never got around to it. I have heard mixed reviews for this one, but I am curious to pick it up. Great review!